Does Your Voice of Customer programme deliver value? To get more value from your voice of customer programme don’t follow the standard, but flawed approach. This means not just using conventional surveys, but instead employing more collaborative and in-depth research techniques. Below I outline some strategies to ensure your voice of customer programme delivers real and valuable insights. The single biggest mistake companies often make when establishing a voice of customer programme is that senior management assume they can agree the objectives and then leave the research team to go away and deliver insights that will drive improvements in the targeted KPIs. To gain real benefits from a voice of customer programme requires a shift in the business culture towards a more customer-centric way of running a business. This requires a high level of commitment and involvement from senior managers. Without a change in business culture voice of customer initiatives risk becoming sterile and primarily a PR tool rather than a force for driving customer centric change. If the customer is not at the heart of all decision making within a business then a voice of customer programme will always be at the periphery of attention and influence. Actions are more important than words. Management need to get their hands dirty by getting involved in co-creation and collaborative techniques to begin a two-way conversation with customers and influencers. Management can’t expect staff to be passionate about improving the customer experience if they cannot spare the time to have conversations with real people. 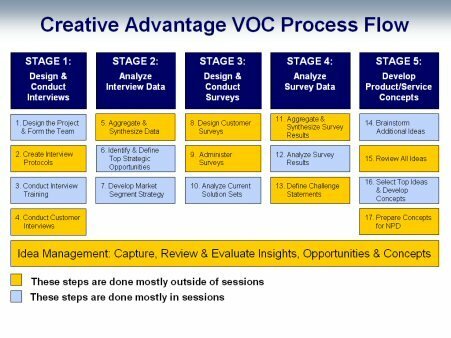 When you first agree your objectives of the voice of customer programme you also need to outline a process for action planning that is signed off by the senior stakeholders. I summarised in a previous post a process for action planning. But whatever your approach,if it is not agreed up front with your stakeholders you risk losing commitment and momentum at a crucial stage in the process. Evidence suggests that the process is probably more important than the analysis as data can easily be interpreted in different ways. It is essential that you involve people from a range of different areas in your organisation and have a diverse mix of skills and expertise. This is the best way to avoid the dangers of groupthink that can lead to small groups being too narrowly focused. It’s a good idea to invite people who have no managerial responsibility or influence over the areas of investigation as they have no axe to grind and can contribute a fresh perspective to the discussion. Although people are very poor at recognising their implicit or psychological goals and recalling behaviour at a given moment, we are much better at observing and understanding what drives other people. This is why sales people and customer facing staff are such a good source of insights into what problems customers experience and what they respond well to. Don’t rely on what Customer Services management tell you as all too often organizational culture prevents front-line staff from being totally honest about problem areas. For numerous reasons people don’t want to be perceived as negative about their organisation in front of management, especially if they want to progress in their career. The true voice of customer is when a customer is interacting with your employees or other customers. This may not be through traditional channels such as face-to-face or telephone, but could be through your website or social media. However, real people are still behind most of these interactions. Even a website robot chat greeter was originally designed by a human. Video mystery shopping is a powerful voice of customer programme technique for evaluating face-to-face interactions. It is great for showing examples of good practice for training purposes and identifying training needs of poor performing staff. Many organisations now routinely record customer telephone conversations with staff. Take a random sample of calls and analyse the experience to better understand both the level of service and how well the customer’s task or need was fully satisfied. Develop a framework to ensure consistency of analysis or bring in customer experience consultants to help you evaluate calls. Observational techniques, such as ethnography, also helps bring the real customer experiences to life. Combined with good listening skills, observing how customers interact with your product can provide new insights to assist you in improving customer acquisition and retention. Stop asking too many questions, and instead observe product usage in a natural environment. Don’t assume customers use your product in the same way that you would. Experiment with customer feedback tools for online services to identify the tasks people are trying to complete on your website. Find out what barriers they experience which may hinder task completion. Visual analytics tools, such as heatmaps and browser recordings, allow you to see how customers interact with your site. By combining the insights with web analytics you can generate ideas to develop hypothesis for improving the customer experience which you can validate through A/B testing. Humans are a “super-social”* animal, and our decisions and behaviour is heavily influenced by the opinions and actions of others. For this reason it can be extremely valuable to identify key influencers and networks that are important to your customers. Research suggests these are not the traditionally targeted early-adopters who are often too engrossed in a gadget to talk with other people. No, social influencers are people that others trust and turn to for advice. They usually have a natural ability to persuade but they are trusted due to their authenticity and independence. The degree to which these people are connected across social and interest groups is crucial and is probably the result of their personality and a source of their influence. These are the type of people you should be listening to as they are often a driver of your customer behaviour. Co-create with key influencers and you stand more of a chance of engaging and motivating the mass of your customer base. Consulting with these people can help you better understand perceptions of your brand and allow you to tap into the real driver of customer behaviour. Thank you for reading my post and I hope it has generated some ideas that you can use in your voice of customer programme. Which Are The Best A/B Testing Tools?